Lately we have read quite a few incorrect comments online about suspension and coilovers, so we decided to write something about it. Firstly, let’s go over a few suspension basics. There are a few popular suspension arraignments, mainly the Macphearson strut, double wishbone, multi link, and solid axle. Basically every modern car is going to be one of these designs, but that’s not what this post is about. Regardless of the layout, there will be a spring to support the weight of the car and resist roll and pitching movements, and then a damper, or shock absorber, to control the motion of the body and suspension. Without shocks, the body could oscillate freely on the springs and that would not be good. The second image is generally what people mean when they refer to “coilovers,” while the first image is often called a strut/shock and spring combo. They both are “coil over” suspension but we will stick to the common terms. At a glance, we see a few differences. Firstly, the springs are different. The second set has smaller diameter springs, which are a standard size and can be interchanged easily with softer or stiffer parts. The shock bodies are also threaded, so the perches can be adjusted up and down. What good does this do? Well, besides the obvious ability to adjust ride height, we can also change the springs, without changing the height. A helper spring (that second, smaller spring in the pictures), allows us to do both without having excessive preload or unseated springs at full droop. The other benefit of adjustable perches is the ability to corner balance the car. Ideally, for the best handling, a car would have equal left to right weight distribution (unless you only wanted to, say, turn left). In reality, this is not the case. One side of the car is going to weigh more than the other because of things like drivetrain layout, the battery position, the driver, etc. If you are working on a race car, it is good to get this balance as close as possible as the car will be driven. But most cars are not perfectly balanced, and even if one was, after just bolting up a set of suspension there would be some uneven preload from one corner to another. We check this by putting the car on four scales to measure the weight distribution, and then the suspension can be adjusted to fix an imbalance .This process is a key part in making a car handle well, and is a huge benefit of having an adjustable coilover suspension. With standard struts and springs, there isn’t much you can do (although moving weight around the car and shimming the top mounts are possibilities. Adjustable sleeves are also available for many standard struts). The other side to this, is when an adjustable set of coilovers gets installed, but then is NOT corner balanced. The result will frequently be worse off balance than if just standard struts/springs were used, and potentially dangerous and inconsistent handling behavior. For anyone who buys a set of height adjustable coilover suspension, corner balancing should be considered mandatory. It is not “just for racing.” Some of the symptoms of very uneven corner balancing can include the following. The car understeers turning one direction, but oversteers going the other. Car prefers turning one direction only. Even with a straight alignment there will be pulling to one side, especially under braking or acceleration. That left-to right handling difference is the main reason for corner balancing, because we usually want a car to behave the same turning in either direction. Imagine that whenever you went around a right hand corner the car wanted snap around abruptly. That might be a good way to end up in the guardrail on the highway. So unless you are ready to cut apart the car, relocate things like wiring harnesses, and can fix the suspension geometry issues caused by over-lowering, that “independent ride height adjustable” set of coilovers might not actually offer any benefits. A well designed set of suspension will run out of shock travel just before the tire hits anything, and they also tend to have more overall travel, which is a good thing for both ride comfort and handling. The main benefit of the double adjustable “feature” is that it makes it easier for a suspension company to use the same shock for a lot of different cars, without having to put much thought into appropriate travel or damping specific for that vehicle. 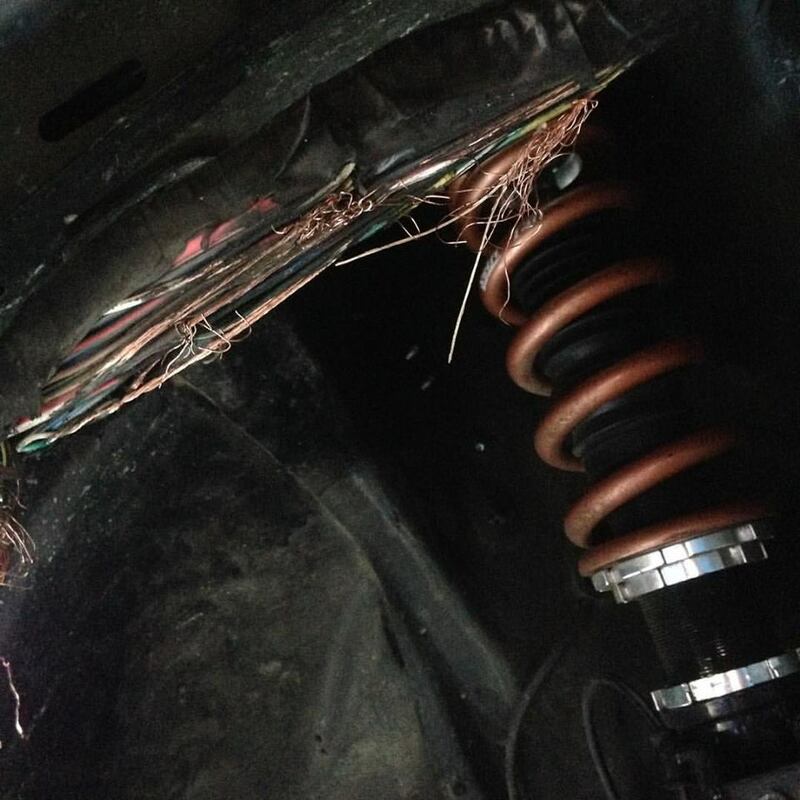 When installing a set of this type of coilover, it is a very good idea to remove a spring and jack up the suspension all the way to the top of the travel to insure the tire is not going to rub. 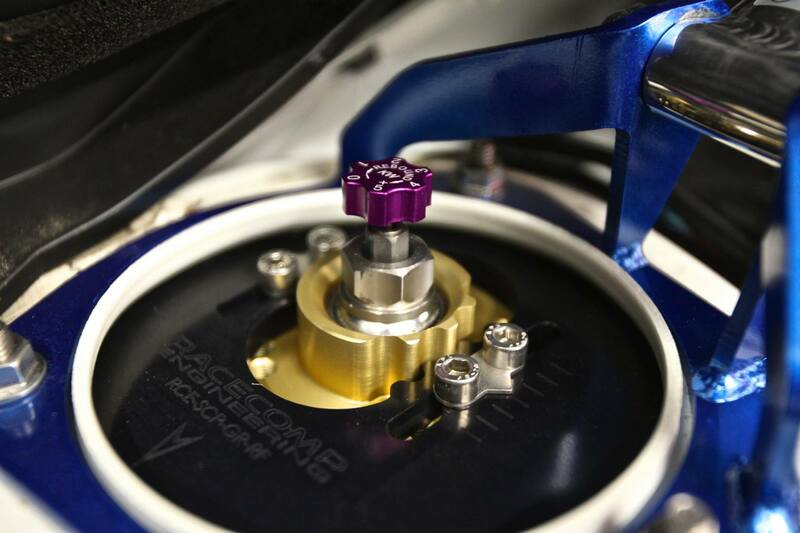 The next thing found on many coilovers is damping adjustment. Depending on the shock, this can be really useful. How the damping should work depends on quite a few things: the weight of the car, the unspring weight, the tires, the spring rate, the road/track condition, and what the driver likes. So there is really no one perfect damping curve for any given car and suspension setup. The best we can hope for is to have something the driver and passengers like and results in better lap times. An adjustment knob or two can really help fine tune both ride and handling. Damping adjustment will also allow a wider range of spring rates to be used before re-valving is necessary. HOWEVER, the person turning the knobs needs to know what they are doing, and the knobs need to do what they are supposed to. There are many good suspensions that do not have damping adjustment, that are well liked and perform well under a wide variety of conditions.. Those yellow struts and springs in the first picture, which are Bilsteins tuned by Racecomp Engineering with their matching springs, are a good example. No adjustments- just install and enjoy. On the other hand, there are many suspensions with a lot of knobs that do not work well. A good rule of thumb is that the cheaper a shock is, the fewer knobs it should have. 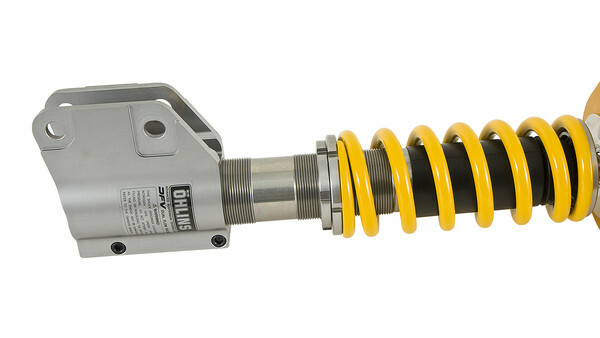 Don’t get fooled by the $1000-1500 double-adjustable coilovers; when they wind up on a dyno it’s not uncommon for those knobs to not do what they are supposed to, and the shocks will often not match. So even though the are set at the same “click,” the left and right dampers are behaving differently. Like we mentioned, the damping required depends on a variety of things, including the spring. With stock/worn out shocks, installing lower and stiffer aftermarket springs is usually not ideal. The right amount of damping for good handling is usually higher than what is best for ride comfort, so while stiffer springs are usually better for performance, the resulting under-damped condition is not. Aftermarket lowering springs are cheap on their own, but in many cases should be paired with a better shock. 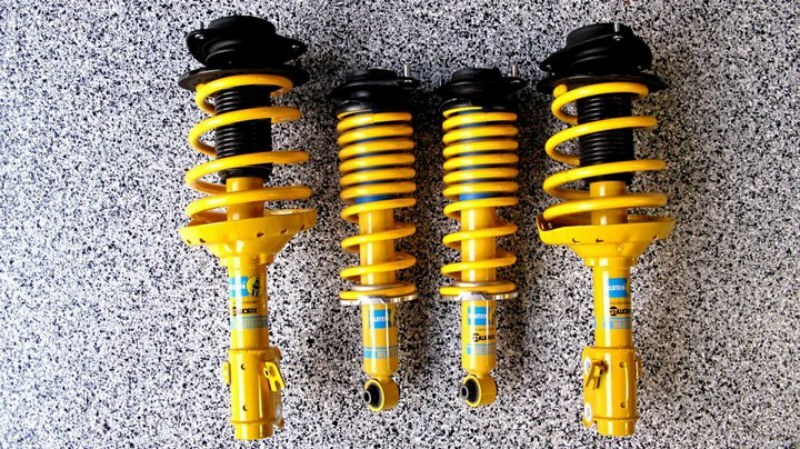 I believe that covers most of the basic differences between what are called struts and springs, and coilovers. For someone looking to change their suspension, it’s important to consider how it is going to be used. For a daily driven car, a good strut and spring combo will often be more durable, more comfortable, and possibly less expensive. 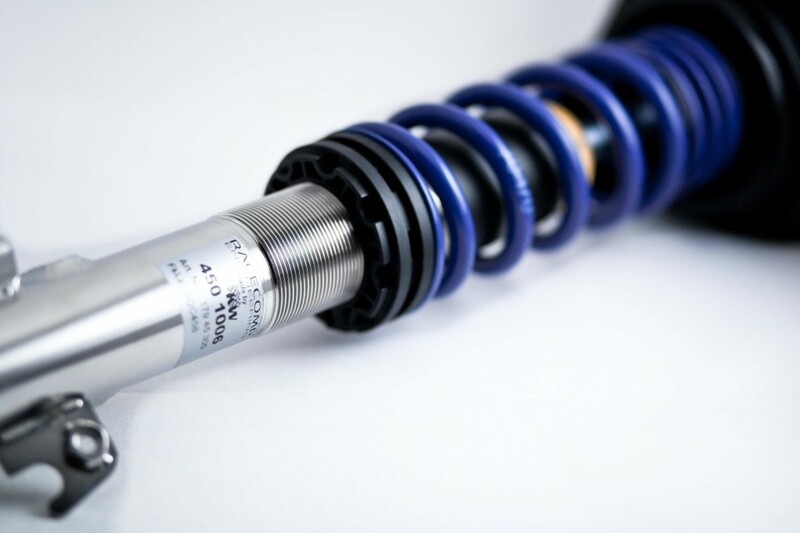 When handling is the priority, the additionally adjustments of some coilover systems can be worthwhile, but they come at a cost. 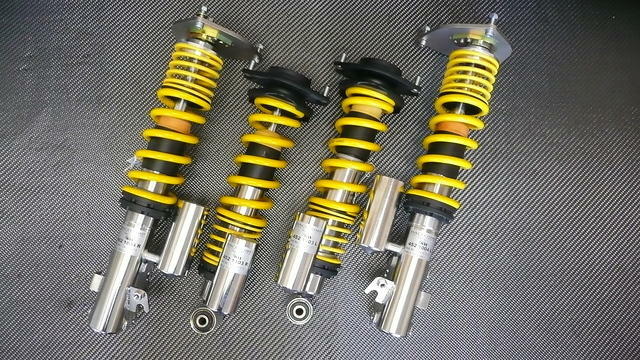 Coilovers that ride well on the street, perform on the track, and will remain trouble free for years exist, but they cost more money. It is also important to consider that the setup and alignment for coilovers is more involved. A standard alignment shop will often not know what to do so it is important to find a place that can properly align and corner balance coilover suspension. I suppose next time we can talk a little more about damping and some suspension brands.. But for a short list of stuff that is both good and fairly inexpensive, start with KW, Bilstein, Koni, and AST. There are also companies that specialize in certain makes and have their own version of products, like the previously mentioned Racecomp Engineering. Almost everything they offer is based on a KW or Bilstein product (and we used some of their photos for this article). This entry was posted in suspension, Tech, things you should know by jamal. Bookmark the permalink.